To let it be or not to let it be... that is the question? The question of age and conditioning in beer is as important and potentially contentious as it is in wine (and people). The very act and method of brewing is a study in time and patience. It is a commonly held belief that the IPA is the beer of youth. A young IPA holds more of its hoppy and bitter edge, and this will mellow out over long periods of aging. So as the theory goes, taste early and taste often! I must admit to having been ignorant of this at the outset, and the first two IPAs I made suffered the whole 3-4 week bottle conditioning process without a sampling. However, do not misunderstand me here, they were fine beers, and have done naught but spur me on in my forthcoming brewing endeavors. But can I go forward living with the doubt? What of their status at week 1 or week 2? As I learn more about this style (and rationalize my process) I see that there's little to be lost in having the complete experience of each beer one makes. 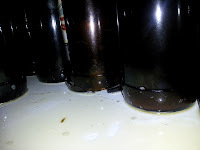 I'm currently only brewing 5 gallon batches, and whilst that doesn't leave huge tracts of room for waste, one or two bottles in the early weeks of conditioning probably wouldn't impact things too much. After all this remains an exploratory phase. 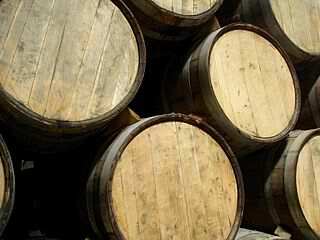 We all have our own barrel warehouse right? Which brings me to a current conundrum, which I am going to say is providing an exciting learning curve! As summer has faded and the foreboding clouds and ominous nights are drawing in, one seeks greater comfort than can be found in the arms of a crisp lager or summery hefeweizen. I seek now instead the velvety security blanket of the stout to ward off winter's chill. 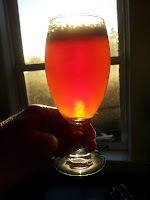 In a seemingly prescient move, I actually made my stout in the depths of August's summer reign; reasoning that I'd miss it were it not to be ready until the following spring (I made it a cherry stout to afford a fond reminiscence of Summer's glory). And in truth I've been as patient and faithful as I could have hoped. It was bottled and primed two months to the day after it had been tucked in for fermentation, and now I sit here musing after 20 days conditioning. I'll level with you here and now; I have tasted it and not just at hydrometer readings. I had a glass that somehow(!) got left over from bottling, and after about 18 days in conditioning I cracked one open to try it. Perhaps somewhat predictably it has proved delectable. The sourness of the cherries (more about them another time) really offsets the sweetness and cuts the heaviness. But now I research the style more and more and am left with one stark realization: conventional wisdom dictates that stouts (and particularly Imperial Stouts - this bad boy clocks in at a burly 9.6% ABV) are aged for near implausible* lengths of time. I feel I should probably go anywhere up to and beyond a year for a truly well aged stout, which gives me pause. I want to live this stout now and enjoy it over the winter months, but in such small batch size this would surely belie its true character. Approaching 3 months aged it would seem silly to go on a spree of consumption and polish it all off before the year is out, but it is so good! The better parts of myself will have to be disciplined and maybe I should trick myself into stowing 2-4 bottles somewhere that I cannot get at to afford the true stout experience. Where an IPA can pass you by fleetingly if you linger overlong, hubris can have you chasing things in a stout that are yet to be. A study in wistfulness if ever there was one. Is patience the ultimate virtue? First of all, major shout out to Scott Kaczorowski - he put together the most viable looking guide for making my own All-Grain brewing system. I looked at many and found the 3 tier, gravity-fed system to be the best use of my means and level of expertise. 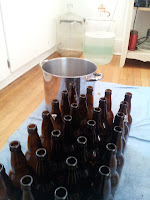 As such I see this as most homebrewers probably do, as a stepping stone. I'll probably always want to add things and simplify/sophisticate my set up, but Scott made this brilliant set up seem achievable for even this metal and wood shop novice. The top Keg - Hot Liquor Tank (HLT) - this is where the water for the Mash is heated to the required temperature. The bottom Keg - Boil Kettle - does exactly what it says on the tin. This is where the extracted fermentables (aka wort - pronounced wert*) are boiled and any hop and special late additions are made. So I made my decision to make keggles, as that is obviously the most aesthetically pleasing route one can take here (chicks just don't dig the cooler man!). It seemed like a cheaper and more fun way to go about things, and the idea of building it myself is and was appealing. The first question was how to go about it, as I'd read many articles on the shady business of the keg black market. I guess there's a whole ethical question about where resold kegs come from and how they are acquired. I used craigslist to get mine, and some transactions were not without moral ambiguity. For instance, the first one I ended up with was plastered with stickers from nearby paragon of craft ales, Fremont Brewing. This stank to high heaven of course, but I bought it anyway (I had driven all the way up to Snohomish for it after all). A couple hours on the drive home spent wrangling on the morality of cutting it up and stripping the stickers and I knew what I had to do. I returned the keg to Fremont Brewing at the next business hour opportunity and asking for nothing was gratefully treated to a growler of my choice on the house (gotta love their Interurban IPA). The beer was good, but the feeling of having done the right thing was even more satisfying. 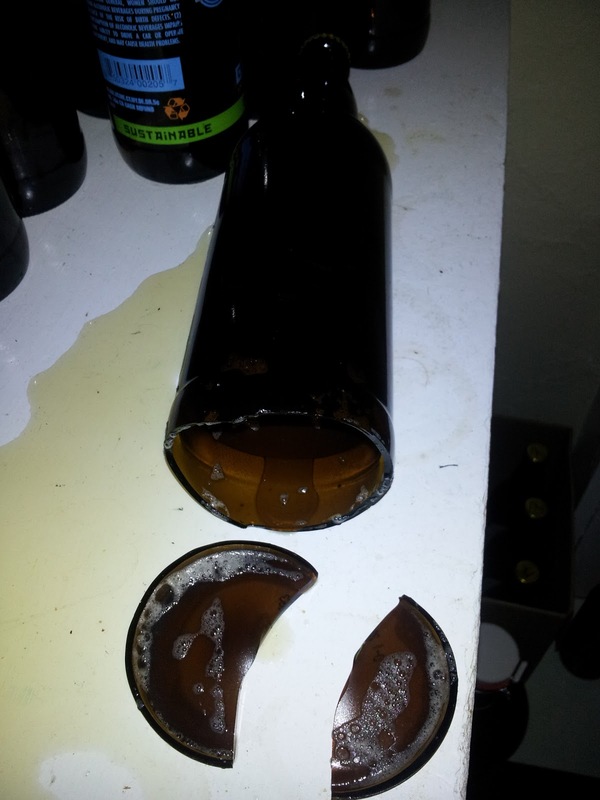 I like to think I notched a couple of brew-karma points that day. After this episode my searches were a little more careful and I was more thorough in finding out the origins of my purchase. In the end I have 3 units which are of satisfactory origin. I have one Anheuser-Busch one, which was already converted before I bought it, one Heilemann one (a now defunct mega-brewery) and one Coors one (I mean come on... Coors? Really?). ...Coming Soon - Part #2 - Cutting & Drilling! Gotta run folks, I have a Spiced Winter Ale that's calling to me with its Siren Song and thankfully for me won't make itself! *I know you're probably excited about the fun and arbitrary brewing jargon being thrown around here. I know I always have a hard time explaining to people whys and wherefores behind brewing terms. My favorite exchange was when it came time to pitch the yeast on one batch. My girlfriend asked me, "What does 'pitch' mean?" and my lame response: "Putting it in." This and much more bizarre wordsmithery (that's right, I said it!) 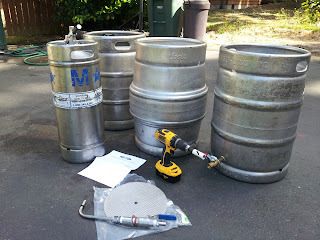 awaits the inquisitive new homebrewer! This is one that I've tried to age for a while. I made it on 8/6/12 from a Papazian recipe base, and I have been waiting with bated breath for it whilst also trying to age it as long as possible. In the end I bulk aged it for exactly 2 months, bottling on 10/6/12. This one had been a challenge to find the required cherries. I had wanted to get fresh ones, but it seemed that was not to be. A devastated sour cherry harvest and grocery stores' general proclivity toward sweet cherries meant I had to find other options. I guess I could have gone to the source to try and get the fresh stuff, but I was getting itchy brewing hands and so I opted for Oregon Fruits Canned Sour Cherries. I used the whole 8-pack and as they were already pitted and in water I was able to just put them all in the primary for a week. I'm going to try and condition this one for a month or so. There was enough for 21 bottles, and nearly a pint left over. I decided to just celebrate and drink it. 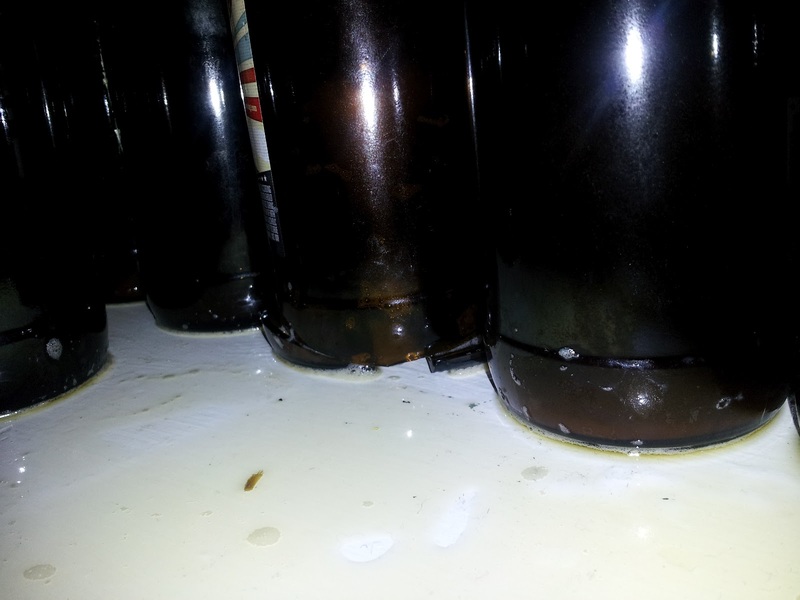 It was pretty glorious, leaving potential for something stellar post carbonation. I carbonated with 3.5oz. corn sugar in a pint of boiling water. I was sure to mix it evenly to avoid disproportionate carbing. There was still a little yeast activity, but it was time. 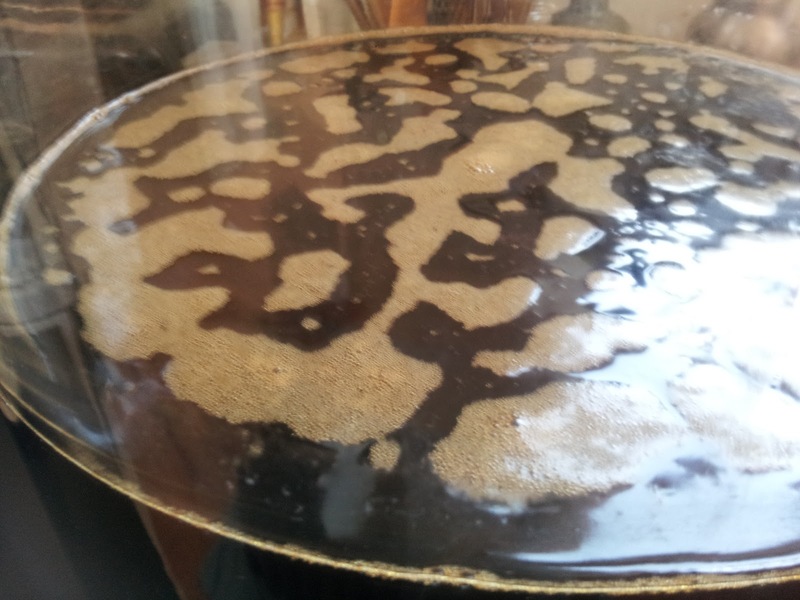 Unfortunately batch #9 contracted some kind of infection between primary and secondary fermentation (we've since gone nuclear on all our equipment with Star San). Based on the research I've done it seems this was some kind of Lacto Bacillus infection. While not a show stopper it does render this batch somewhat... experimental shall we say. Some of them are turning out fine, others very heavy with sediment, and yet others gushing multiple feet in the air upon opening. This seems pretty rare but I've read stories, some sounded pretty dangerous and messy - especially this one. So one day we hear a thudding sound and search the whole apartment looking for something that had presumably fallen off a shelf or similar. Finding nothing we continued our regular evening. Later when coming to check on a batch in our brew closet I found a small pool of beer in the top of our primary fermentation bucket. My first thought was that the primary had blown out of the fermentation lock, but a cursory taste didn't gel with the IPA I'd recently tucked away. Eventually I noticed that the beer was dripping down from the shelf above, the bottle shelf. 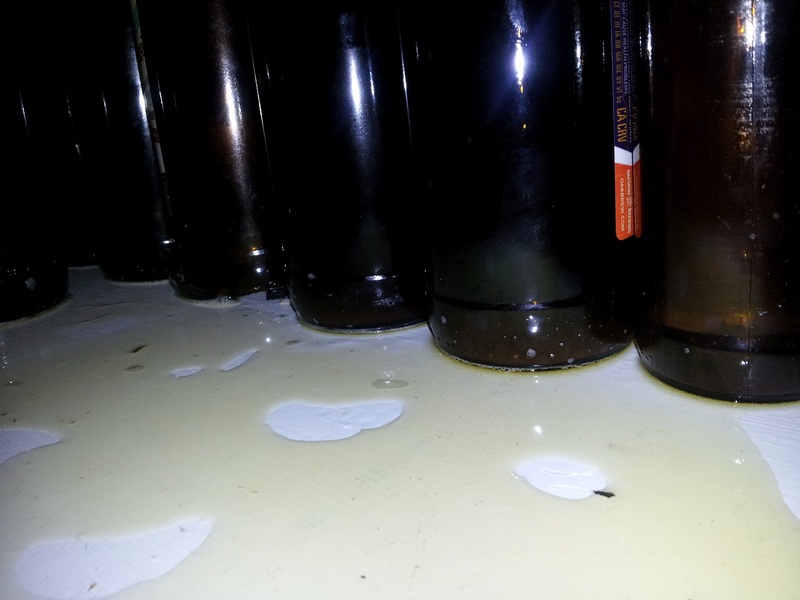 All the bottles looked fine from the top down, but all were sitting in a puddle of beer. I ended up having to remove the lot to check each one. See the odd one out? 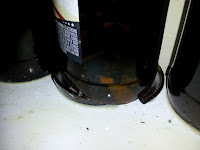 So one of these bottles had the bottom shear clean off and split in half, with the upper portion sitting in the newly widened base. It was a hassle to clean up the whole closet, two fermenters and 20-30 bottles, but I was glad to have dodged a bullet in terms of injury and property damage. Lesson learned: mix the priming sugar more thoroughly. I'm not sure if this would have helped what with the Lacto infection, but its good practice anyway and I have had uneven conditioning with less deadly consequences. As for #9, I think I'm going to put it away and see if it sours up. But it might be a lost cause depending on my ongoing bottle needs. Either way there will be kegging in my future.